‘Nanny, please don't make me cry,’ Elsie cried. Wrapping her arms around her young granddaughter tightly, Ellen let the book fall to the ground. ‘But the doll hasn’t got her head and her arms are broken,’ came a despairing wail. The sound of sirens could be heard coming up the road, Ellen and Elsie rushed to the window to see out. The ambulance stopped right outside their house. Elsie looked at her grandmother. Ellen’s voice was reassuringly calm as she brushed her lips against Elsie’s curly ringlets. I loved this story! Excellent writing! When I was a little bitty girl I had a doll that I just loved and it was in desperate need of repair. My grandmother talked to me for a long time to get me to give up my doll so she could send it to the doll hospital. I really didn't want to let her have it but I finally did. I honestly don't remember if I ever got it back. Great story! I hope the doll comes back in one piece, though she seems to be in a pretty bad way. I have had a couple dolls repaired. I fear it's a dying art where I live. 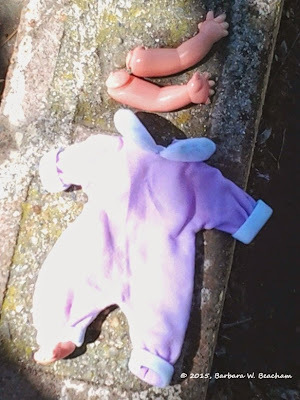 Your story is sweet, but now I'm frightened for the future of all well-loved dolls. I enjoyed the link to the recent Royal arrival, nicely done.